The president of football's world governing body Sepp Blatter falls under criminal investigation in Switzerland. He hung on to the top job at Fifa while many others around him were arrested on corruption charges. 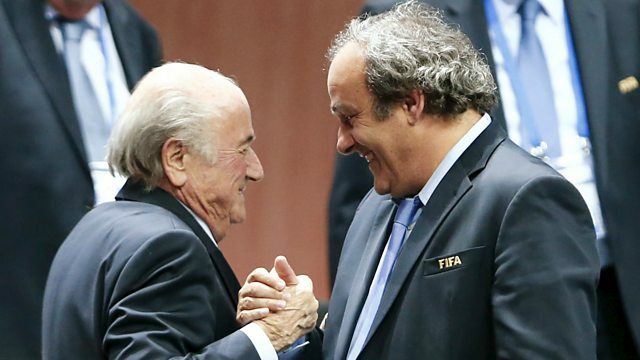 Now Swiss investigators have begun a criminal investigation into the president himself, Sepp Blatter. We hear from Swiss MP Roland Büchel, who has long been campaigning for Fifa to clean up its act. Volkswagen board members spent much of Friday locked in meetings before naming Matthias Mueller of Porsche as the new man in charge. It comes a week after the United States' Environmental Protection Agency declared the car manufacturer had been cheating the results of emissions tests. Theo Leggett reports from Wolfsburg and Dr Konstantinos Chalvatzis, an expert in energy technology at the University of East Anglia, tells us what the scandal will mean for consumers. Talks have been taking place at the White House between the world's two most powerful leaders - President Obama and the Chinese leader Xi Jinping. The two countries seem to have found some common ground on tackling climate change. It's been confirmed that China will set up a national carbon trading scheme. Jennifer Turner from the China Environment Forum at the Woodrow Wilson Center in Washington DC gives us her reaction. We also hear from north-eastern Spain ahead of Catalonia's elections on Sunday. Many see the poll as a vote on independence. And our colleague at US Public Radio Kai Ryssdal takes a trip to the world headquarters of Domino's pizza to meet CEO J. Patrick Doyle. Throughout the hour we're joined by Danny Samson, Professor of Management at the University of Melbourne.